Hekab Be Biblioteca ~ Open Road Community Library: Summer School --weeks 2 & 3! Summer School --weeks 2 & 3! HOURS: M-F 9:30 am-5:30 pm (closed 12:30-2:30 pm) Closed Saturday & Sunday during summer course. 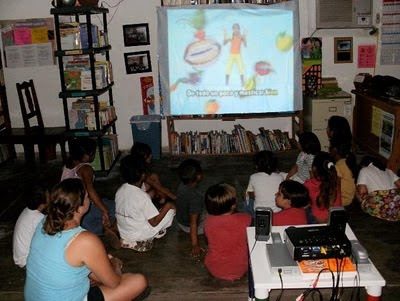 During the second week of our summer course, the children learned about fruits and vegetables, visited the local mercado, and participated in fun exercise activities each morning. 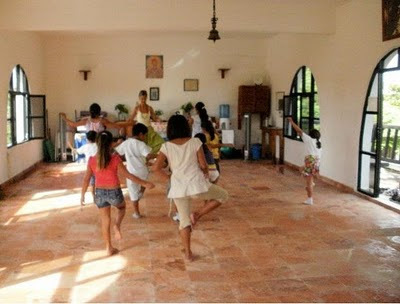 In addition, the kids had the opportunity to experience yoga with our friend, Marti Johnston, at the "Yoga in Akumal" studio (www.akumalyoga.com). More summer school photos can be seen in our facebook album (click here). 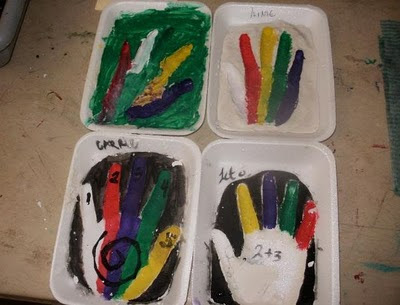 The last photo of the hands, show the 5 portions of fruits and veggies we should have each day and the five varieties of colors.